Louisville is known for many things. An online search of Louisville shows lists of things the city is known for. It’s the home of the Kentucky Derby, Louisville Slugger Baseball Bats, UPS World Port, Brown Forman, and KFC. Louisville is the birthplace of the Hot Brown, the Cheeseburger, Derby Pie, and Muhammad Ali. Minor league baseball, college sports, the food scene, bourbon distilleries, the arts, and the parks system round out “things to do” lists. But not a single list includes Louisville’s greatest driver of economic growth. The health care sector and its history is nowhere to be found. The Health Enterprises Network took action and filled this void by compiling Louisville’s Healthcare History in conjunction with the Louisville Map of Health-Related Companies. 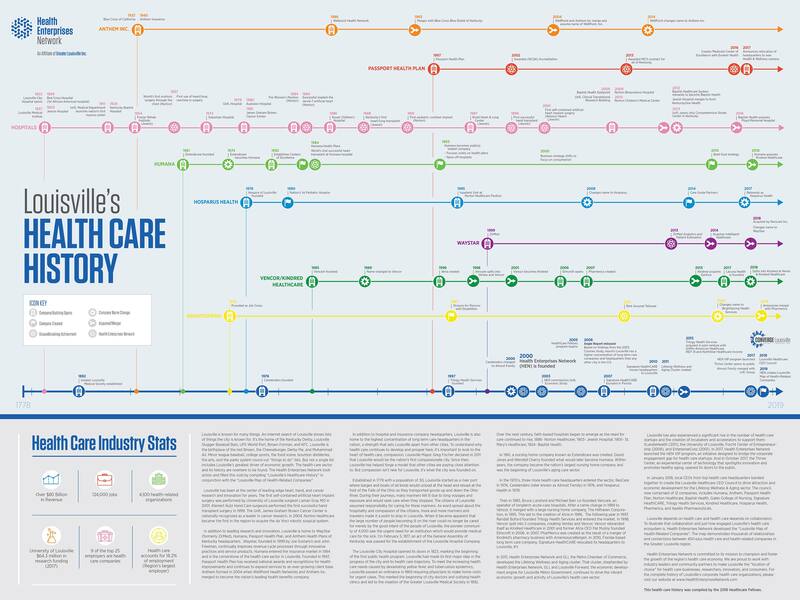 The Network Map lays out the story of health care in Louisville through a timeline from the city’s origin to its modern-day evolution into the aging care epicenter of the nation. The Network Map also includes the first-ever written compilation of the city’s health care history. Harnessing a narrative of Louisville’s historic strengths in health care allows us to shape new opportunities for the region in the future. Louisville’s Health Care history was compiled by the 2018 Healthcare Fellows.